Double Size:76" x 60" x 25"(AC Air Pump Included). 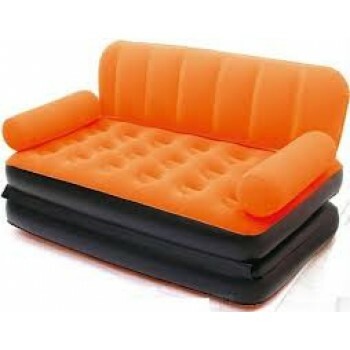 It can be inflated/deflated by the electric air pump. 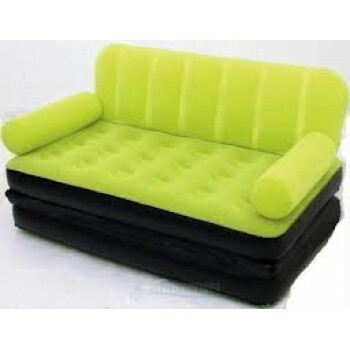 Velvet Branded 5 In 1 Air Sofa Bed Air Louncher Double Size:76" x 60" x 25"(AC Air Pump Included). Product Description :-This Inflatable Multifunctional Couch with AC Air Pump is perfect for dormitory, TV room, living room and bedroom. 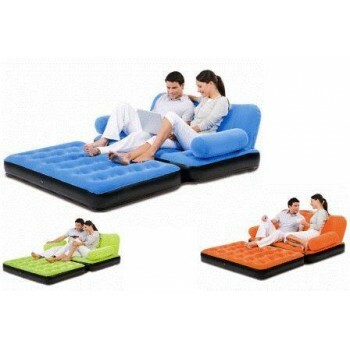 Along with its convenient folding design, it can be unfolded as a double bed or folded up as a couch. It is made out of sturdy pre-tested vinyl, has coil beam construction for additional strength, comfortable flocked surface and can be quickly inflated/deflated by the electric air pump included that inflates the whole couch in 180seconds!! It’s a stylish sofa A luxurious lounger A relaxed recliner a children high rise sleeper and a beautifully blissful bed. It is made up of 3 sections; 2 base segments, connected by flexible tubes, holding them together and allowing air to flow between the two, and an upright (back rest/arm rest) section. So your pump can be used to inflate virtually any kind of inflatable. Inflates in about 90 seconds. 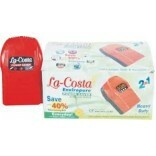 Includes lightweight duffle bag for easy storage. Easy clean up & 120V UL-approved AC pump is detachable. The 5in1 Sofa Bed is the ultimate sleeping and seating solution. 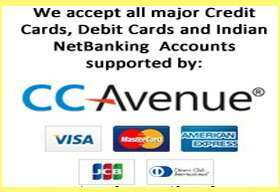 It is built with 5 In1′s technological advances in weightless load technology. 5in1 Sofa Bed is made of high quality PVC with best price. 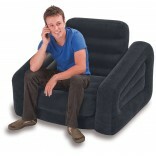 You can even use the 5in1 Sofa Bed outside around the house, camping and even in the pool. It is a sophisticated Sofa. A Children’s high rise sleeper and a beautifully blissful bed. The 5 in 1 Sofa Bed will make a great addition to any living room, bedroom, guest room. 5 in 1 Sofa Bed. 1 Piece Pump Nozzle set.